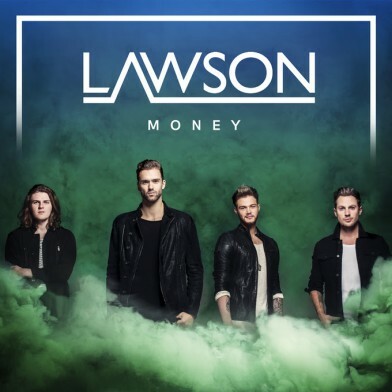 Lawson today unveil gloriously upbeat new single ‘Money’, the next single to be taken from their forthcoming sophomore album. A future anthem-in-waiting, ‘Money’ (Polydor Records, March 18th) is a stunning slice of carefree, optimistic pop rock and sees Lawson – Andy Brown (lead vocals/ guitars), Ryan Fletcher (bass), Joel Peat (guitar), and Adam Pitts (drums) – on the sort of classic songwriting form that propelled them to million selling status in the UK. Since the release of their hit single ‘Roads’ last summer, Lawson spent the last six months touring the US, UK and Australia. The band were selected by Robbie Williams himself to be the main support act on this Australian Arena Tour. Robbie was so impressed by the band’s ability he asked them to join him on stage each night of the tour for a show-stopping rendition of ‘Back For Good’. Talking about Money, lead vocalist / songwriter Andy Brown says: “We first had the idea of Money when we were unsigned and touring around in an old van, absolutely skint. We used to sing ‘Where’s the money? !’ after driving 100’s of miles to play to 10 people! Four years since writing ‘Chapman Square’- the top 5 debut album which spawned five top 10 singles and saw Lawson sell a million records in the UK alone- performing at V, T in the Park and The Isle of Wight festival in the process— ‘Money’ is the sound of a band at the top of their game, and a supremely confident taster of their eagerly anticipated second album.